14.That the blessing of Abraham might come on the Gentiles through Jesus Christ; that we might receive the promise of the Spirit through faith. Believe...and act on God's word. Faith comes by hearing and hearing by the word of God.We live in a crazy adverse world and if we don't have faith we won't have victory when things and circumstances come upon us and against us. None of us is perfect but if we do something that we know isn't right,we repent, we turn away from and press forward to God's purpose for our lives. When we walk out of love ,or we sin let us be quick to get back on track. Don't listen to the devil's lies that you aren't worthy. While the world was sinners Christ died for us. So keep that in mind when the devil tries to lie to you. Now... we shouldn't expect that we can please God if we go to church on Sunday and live like the devil the rest of the week. When Christ died he took all of our sin sickness, illness, disease and curses upon himself to deliver us from them all and to set us free so that we could have the blessings and abundant life.If we stay in sin and know it is wrong then we cheat ourselves out of the fullness of God's promises. To please God, we need to be in His Will and purpose for our life. In doing so, we can have life more abundantly. How do we know what His purpose is? He puts a passion in us for what we love to do better than eat or sleep. 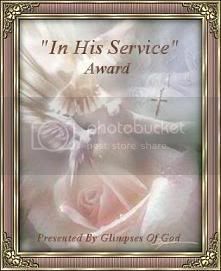 We all are called into the ministry, whether it is to minister at your place of employment or where ever you get the opportunity. 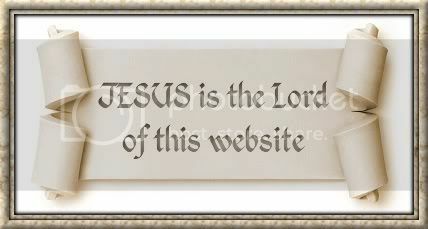 I know that I can hardly be online or on the phone or if I get out without bringing up my Jesus. The bible is the owners manual for us to follow and feed on to become strong in the Lord and to fight all the wiles of the devil. He wants us to doubt, he wants us to be sick, he wants us to have strongholds in our lives,He is out to kill,steal and destroy ! Let Us put on the armour of God and get to rebuking the enemy of all His lies and deceitful thoughts and ideas. God made an oath in blood with Abraham , in those days if an oath was given in blood it was death if any man broke it, so how could God the creator break this oath. 23.But before faith came, we were kept under the law, shut up unto the faith which should afterwards be revealed. 24.Wherefore the law was our schoolmaster to bring us unto Christ, that we might be justified by faith. 25.But after that faith is come, we are no longer under a schoolmaster. 26.For ye are all the children of God by faith in Christ Jesus. 27.For as many of you as have been baptized into Christ have put on Christ. 28.There is neither Jew nor Greek, there is neither bond nor free, there is neither male nor female: for ye are all one in Christ Jesus. 29.And if ye be Christ's, then are ye Abraham's seed, and heirs according to the promise. So if we be in Christ we are to be delivered from all the curses.The devil is more in force here in these last days than ever before. He knows his days are numbered so no matter what symptoms we have, we must call the devil a liar. We must rebuke any and all things the devil is trying to put on us.If we have pain we must speak out By His stripes we were healed...Day after day,after day until God's word takes root and is birthed! In Mark 4:14 it is written...The sower sows the word. Is it not said we will reap what we sow. Let's battle the devil back with God's word and promises to us, let us rise up and take authority as God created us to do. He gave us dominion. We have got to get ahold of the power and authority that is ours as believers. The enemy is attacking the body of Christ like never before, come on saints it is time for battle. Greater is He that is in us than he that is in the world. 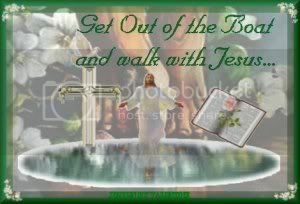 It is written if we rebuke the devil he must flee. Trouble is he is sneaky and sly and doesn't play fair and before you know it we are beat down, but....Victory was won when Jesus rose again and that same victory is ours to know that we know,God will never leave us nor forsake us and instead of getting weak we must get awake, instead of getting bitter, we must get better, instead of getting pitiful, we must get powerful!! God wants us healed, and delivered from all the curses and diseases that the enemy is dishing out. You are a child of God and you are worthy to be set free, He loves us as much as He did His Son Jesus. Look in at Jesus' ministry..
.in Acts 10:38 How God anointed Jesus of Nazareth with the Holy Ghost and with power: who went about doing good, and healing all that were oppressed of the devil; for God was with him. There were so many people that were healed by just having faith and believing in the miracle working Jesus. Is He not the same, yesterday, today and forever? Oh how blind Bartimaeus yelled for Jesus, He knew because he had heard. He couldn't read like us to build His faith, He couldn't even defend himself if someone wanted to do him harm for not hushing up but none of that mattered, He knew that he knew, it was his surety that Jesus could give him his eye sight. Oh my...Let this story grab ahold of each of us. Let us be bold as blind Bartimaeus with eyes that can see, with tools that can build up our faith. Real quick another story of the woman that had an issue of blood. She had faith an Knew that she knew if she could only touch the hem of His garment she would be healed. These people got it, that in order to have it, you must speak it out, make a move by faith and trust that God's word won't return void. He is no respector of persons. What He's done for others He'll do for us. As we speak it, the more it will come to life. Speak what you want, not what you lack or have. 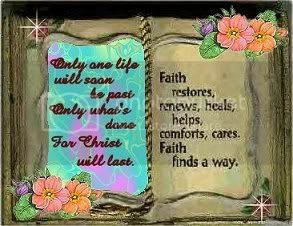 God bless you dear ones, May you feed on the word daily and may your faith rise! I know mine does with each sharing of God's word. Also I am sharing a news letter from Kenneth Copeland that includes a prayer.I felt led by the Holy Spirit to add with this. God bless you one and all! Someone once said that the reason I can live like I do is because I have special faith. But, you know, that's just not true. I don't have special faith. God has given me the same measure of faith He's given to you and every other believer. The only reason my faith looks like it works better is because I use it! If you've been living in the shadow of a mountain, waiting for God to give you some kind of special faith, make a change today. Step out and put the measure of faith you have to work moving the spiritual, physical, mental, or financial obstacles Satan has brought against you. Romans 12:3 says God has dealt to every man the measure of faith. Believe Him! Step out in faith about that faith! Say, "Heavenly Father, I thank You that through faith in Jesus Christ, You have shared Your nature and Your Spirit with me. I am grateful for the measure of faith imparted to me as a believer. "I make the decision today to walk in that faith. To put it to work on the situations around me. I commit myself to operate in mountain-moving faith, for I know that it is impossible to please You without it (Heb. 11:6). "As I plant this faith and water it with Your Word (Rom. 10:17), I expect it to grow and overcome the mountains in my life and in the lives of those for whom I intercede. "Thank You, Father, that as I do this, nothing shall be impossible to me! In Jesus' Name. Amen."